Wheelchair basketball athlete Shayne Smith (Toronto, ON) visited Copper Cliff Public School in Durham, Ontario Friday to educate students about sport for athletes with a disability. As part of the Canadian Paralympic Committee’s Paralympic Schools Week (February 21-24th), he shared the story of his journey as an athlete and focused on the importance of setting goals and being motivated to achieve success. Paralympic Schools Week is designed to raise awareness and understanding about parasport, including the ways in which all Canadians can get involved in the Parasport Movement, whether as a participant, coach or volunteer. With the London 2012 Paralympic Games just around the corner, it was an opportunity for Copper Cliff Public School to experience the excitement and diversity of parasport and to share in Team Canada’s quest for glory. The Paralympic Games will take place from August 29 to September 9, 2012. 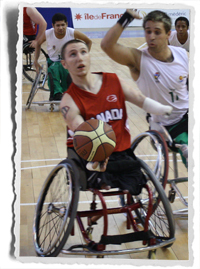 While Smith is not a member of the Senior Men’s Wheelchair Basketball Team that will compete in London, he has represented Canada at two World Junior Championships. As a 15-year-old, he was the youngest player on the team in 2005, and became the only returning player at the next event in 2009.